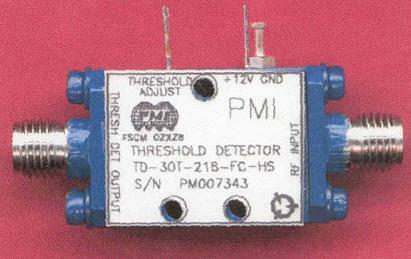 PMI Model TD-30T-218-FC-HS is a high speed threshold detector designed to operate over 2 to 18 GHz frequency range. It has an external adjustment to vary the threshold level from -10 dBm to -20 dBm, with an input flatness of typically +/-1.0 dB and VSWR of less than 3.0:1. This unit comes in a very small size with field removable SMA connectors for surface mounting or typical coaxial connection. Size 0.80" x 0.62" x 0.40"